Castor oil is considered to be one of the most effective oils for hair thinning and hair loss. Two weeks ago I met a new friend. And she, as me, is quite passionate about natural hair care. So it was like meeting your hair-mate. Let me tell you she has lovely hair – thick, black, soft and shiny. We had a lot to talk about – fingernail rubbing, henna packs, oil massage and other hair stuff. During the chat she also mentioned about her experience of using castor oil on her eye brows; she noticed that in couple of months time of using this oil her eye brows had grown thicker. I have heard a thousand times that castor oil can make your hair grow and reduce hair fall. But this knowledge was just sitting dormant, until recently when this new friend told me of her experience. I have come across many people who have benefited by application of castor oil. In one of the posts I spoke about my cousin who makes a blend of oils (almond, coconut, sesame and castor oil) and applies on her hair. She has very thick, long and shiny hair. What is castor oil ? Since time immemorial, this oil has been used for skin and hair care. 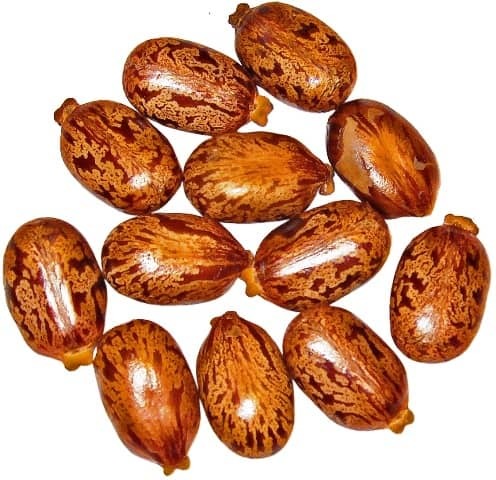 Castor oil or Ricinus communis is extracted from the seeds of the castor bean plant. Castor oil is a colourless to very pale yellow liquid with mild or no odour. When you touch this oil, it feels sticky and thick. Castor oil is a humectant – meaning it attracts and retains moisture to the skin and hair. The goodness of castor oil can be attributed to high amounts of ricinoleic acid – an unsaturated omega-9 fatty acid. Castor oil penetrates skin easily without occluding it. Regular use of castor oil is purported to stimulate and increase hair growth, reduce and prevent breakage, and condition and moisturize hair and scalp. This versatile and highly beneficial oil can be your hair saver. Let’s see how to use castor oil for hair growth and thickness ..
As a humectant, castor oil absorbs moisture from the environment. This oil is especially useful for dry and damaged hair, as it helps to retain the natural moisture and/or draws moisture from the outside in. A well moisturised hair will become shiny and strong. Castor oil works very well as a lubricant for the hair. It coats the hair and protects it from friction damage during washing and combing. You may need to use slightly more shampoo to get the oil out of your hair. But the after benefits: thick glossy hair are well worth the effort. Castor oil has low molecular weight, so it penetrates into the skin easily, and act as a softening oil. It is also non-irritant, making it useful for dry and sensitive scalp. The omega -9 fatty acid in the castor oil keeps the hair well moisturised, and provides nourishment to your scalp and hair roots. Undernourished scalp and hair causes hair loss and other hair related problems. Castor oil prevent the hair from becoming dry and brittle, facilitating healthy hair growth. Regular application of this oil to your hair will make your hair soft, shiny and bouncy within days. When your hair is well conditioned, it appears healthier and thicker as compared to unhealthy hair strands. Also, you will have no frizz and split ends. Castor oil is low comedogenic – it does not clog the pores. When you massage castor oil onto your scalp it removes dirt, dead skin and dry flakes that clogs the hair roots. The antibacterial and anti-fungicidal properties of ricinoleic acid in castor oil protects the scalp from infections which can cause hair loss. The healing properties of castor oil improve the quality of scalp, making it easier for healthy hair to grow. Castor oil is very sticky and can be difficult to apply on its own. It is best to dilute it with other base oils such as almond, jojoba, coconut, sesame or olive. You can also add 2 to 3 drops of essential oil such as lavender or ylang ylang. Massaging will improve blood flow to the scalp and roots (any oil massage will increase circulation), and remove dry flakes and dead skin. Wash out after an hour or two, or allow it to stay in overnight for a deep conditioning treatment. With just two application my hair are already feeling more bouncy and more fuller. Castor oil is a hair elixir, as it can solve different hair problems. There are not many scientific studies on effect of castor oil on hair. However, there is ample anecdotal claims certifying its effects on various hair problems. After regular usage of castor oil, people have reported new hair growth, better hair and scalp health, more luster and more oomph. Remember, you will not see your hair growing overnight. Give it few months for the oil to show its effect. Where to buy: Castor oil can be purchased at Indian grocery store or online (buy here). It is cheap to buy and lasts long, as due to its thick nature you need to apply very little for most effect. Always buy cold-pressed, unrefined Castor oil that retains its valuable nutrients. Avoid buying refined or adulterated oil as it doesn’t have much goodness left. can I substitute almond oil with sesame oil ? Hi Sharifah, yes you can. I have very greasy root and very dry ends I’ve been using a shampoo and conditioner that have Jamaican castor oil in them, but notice that my roots get super oily! And my ends are hard to comb out. Is there a way that I can stop that from happening and still get the benifits of the castor oil for hair growth? Stacy, apply a few drop of almond oil to the ends, before and after you wash your hair. And you can apply green tea rinse to condition. I hope you achieve perfect hair you want. Hi, I was wondering if I can dilute castor oil with amla oil? I found a bottle of that for hair at the local international food store. Yeah! !I think u can as I use this as well and it works for me….. I tried it for the first time last evening, left it all night. Washed my hair this morning, 3 times with a natural home made shampoo and my hair (pretty long) looks so greasy today… will it get better if I do it more often? Did you use castor oil on its own? What shampoo did you use? Hi, I’m male, 30yo. I’ve lost a considerable amount of hair over the last few years. How often can I use the Hair growth Oil Blend mix in a week? I am also using once a week a herbal ayurvedic product, and practicing balayam every day. How long should I wait before noticing regrowth? Hi, you can use once or twice a week. Ok, thanks. I know that is subjective, but how Long did It take for you to see regrowth, and what should I realistically expect? ? Hi can I used castor oil everyday? It will make your hair sticky. Can keep castor oil oiled in our hair for long time like 2-3-4days? I wouldn’t leave it on for more than a day, as oiled hair collects dust and dirt. I have been using a mix of castor and coconut oil for a couple of months now. My scalp is flake free and my hair is super soft and shiny. I have thin fine hair and have tried all kinds of treatments as a kid, but this has worked the best. I have noticed my hair is a bit thicker and I have baby hairs growing all over. I use it overnight every other day and wash it out in the morning. I do have to scrub my hair twice with shampoo to get all of the oil out, but it’s totally worth it! Laura…do you use equal parts castor and coconut? Is your hair damp when you put it in? Add olive oil, same quantity as almond. Any kind of olive oil? And do I add this in addition to my almond oil? And this will thin it out? Use virgin olive oil. Yes add in addition to almond oil. Thanks for sharing your experience, I am so glad it worked for you and made your hair soft and bouncy. I’m a guy. My sister blends this with coconut oil and tells me to use it for my scalp. I put it once a week. Is this good for my hair? It sounds good. How’s it working for you? What is the best shampoo and conditioner to use with this oil and do I wash my hair(shampoo and condition) then put the oil in while wet? If I leave it in all night do I wash it in the mornings? Does covering your hair with a steaming towel improve penetration of the applied oil? HELLO, Can i plz know if i can mix castor oil and amla oil together and use on my hair? Hi Minaz.. Thank you for sharing such useful information. Please tell me whether the castor oil that is used as laxative and sold at pharmacy would be okay? Because I have got one from a pharmacy that is taken internally as a laxative.. Is that castor oil unrefined or cold pressed that you have mentioned above? Yes it should be okay. Is that castor oil that is sold at pharmacy is cold pressed or unrefined? Hiiii minaj is it really works , I am suffering from lots of hairfall , then it will regrowth hair , how to use and price of this oil , which type of castor oil . Is this a good product to buy? i have been experiencing a lot of hair loss lately. Is Castor oil IP the same as the castor oils that you mention?i have bought a botle from the chemist but dont know if should use it. Oil is a little hard to remove and requires multiple application of shampoo when i wash my hair. Can this spoil the goodness that the oil has done to my hair?? I have been using castor oil as a replacement for hair pomade because the pomade I had been using had several different alcohols in it. Do you think using castor oil daily and leaving it in all day is alright to do, or could this eventually be bad for my hair? Jason, castor oil is a great replacement to chemical based pomade. You can also use shea butter. What if after applying the oil, the next day I wash it only with plain water instead of shampooing?? Bebo, Yes that’s fine, just that your hair might be left sticky. But if you are OK with that that’s cool. If shampoo is your problem then you could try urad dal or black gram flour (make a runny paste with water) to wash your hair. Thanks Minaz for sharing your wonderful tips. Thanks a lot for all the useful information.